GRP Dry Valleys provide a robust, durable and lightweight alternative to lead and zinc valleys. Allow 150mm overlap for rafter pitches 40° – 60°. Allow 200mm overlap for rafter pitches 22.5° – 39.5°. Allow 250mm overlap for rafter pitches 17.5° – 22°. Dry valley troughs are suitable for roof pitches up to 60º. It is strongly recommended that where possible, plywood or other suitable valley boards should be used. The underlay material and battens should be fixed in accordance with standard roofing best practice with a batten running the length of the valley on each side to accommodate the external raised water bar section. When starting at the bottom of the using the dry valley lay a 150mm long GRP pre-cut valley section support should be positioned close to the eaves. Then cut a piece of 300 mm EasyForm® lead replacement approximately 600 mm long and this should be overlaid onto the GRP pre-cut valley section (ensuring 150mm overlap), ensuring that the Easy-Form® is stuck to the pre-cut valley and lapped over the longitudinal battens. The bottom of the easy form piece should overhang the eaves. The dry valley troughs are fitted onto the valley boards and should be firmly fixed from the Easy-Form® section upwards, using suitable large headed roofing nails on either side of the trough and through the top flat section of the water bar, at a minimum of 500mm centres. into the rain water gutter. It is important to ensure that the valley troughs are cleared of any debris on completion, so water flow is not impeded. 1. Dry valley troughs are suitable for roof pitches up to 60º. Where possible, plywood or other suitable valley boards should be used. 2. The underlay material and battens should be fixed in accordance with standard roofing best practice with a batten running the length of the valley on each side to accommodate the external raised water bar section. 3. When using the eaves closure, the 150mm long GRP pre-cut valley section support should be positioned close to the eaves. 4. The eaves closure piece should be overlaid onto the GRP pre-cut valley section (ensuring 150mm overlap), ensuring that the side winged sections are located over the longitudinal battens. The bottom of the eaves closure piece should overhang the eaves. At the highest point of the eaves closure section a large headed galvanised or aluminium nail should be fixed through the section into the longitudinal batten. Note: A length of flexible packing is supplied with the eaves closure, to use if required to form the continuation of the side support timber battens (when the angle of the valley does not allow the battens to extend to the rear of the fascia board). 6. If the valley trough finishes at a ridge section with a corresponding valley, close off the top piece. 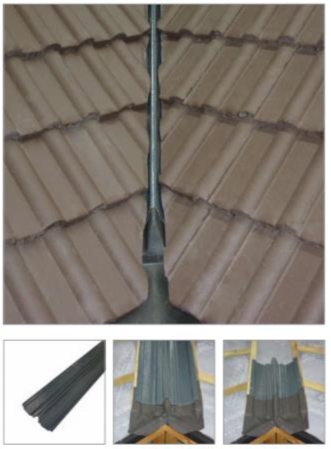 Easyform lead replacement flashing is to be used 300 mm x 600 mm. Overlapping the dry valley troughs equally both sides (150 mm) again adhering the Easyform to the GRP dry valley.to form a neat and tidy, waterproof seal. 7. 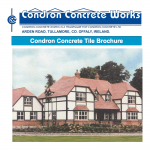 Tiles or slates being laid into and over the troughs should be laid in accordance with the manufacturer’s recommendations. When cutting tiles or slates it is important that neither should be forced to fit. The central raised section of the Dry valley trough should not be distorted. 8. Where possible the roof tiling should be planned to avoid small cut sections. However, in some instances small cuts will be required. Self-adhesive packers are supplied with the valley to support these small cuts if required. 9. 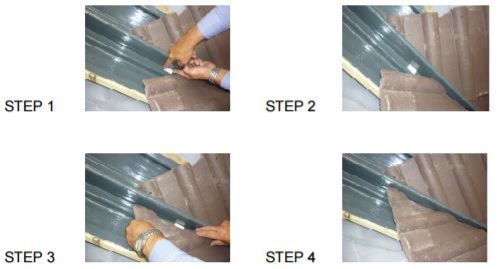 When the slating or tiling has being completed, the eaves closure section should be cut with a sharp knife or scissors to allow water discharge into the rain water gutter. 10.It is important to ensure that the valley troughs are cleared of any debris on completion, so water flow is not impeded.